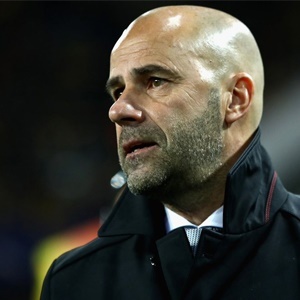 Berlin - Under-pressure Borussia Dortmund coach Peter Bosz admitted a win over Schalke in Saturday's Bundesliga derby is now crucial for his precarious position, following his team's home defeat by Tottenham Hotspur. Second-half goals from Harry Kane and Son Heung-min sealed Spurs' 2-1 comeback Champions League win, which ended Dortmund's slim hopes of reaching the last 16. Pierre-Emerick Aubameyang broke his goal drought against Tottenham, but the loss means Dortmund are now winless in their last five games. They sit fifth in the Bundesliga, where they last won at the end of September. Dortmund desperately need a win at home to second-placed Schalke to break their negative run and relieve the pressure on Bosz. "We have to win the derby," said Bosz, who took charge in July, two months after Thomas Tuchel's sacking. "I know it's important that we beat Schalke for my position at the club." The Dutchman, who led Ajax to the Europa League final defeat by Manchester United last season, bristled when asked if the Schalke game was effectively a final in terms of his future. "I wouldn't say that it's a 'final' game for me, but when you are at a big club like Dortmund, the pressure is there and you have to win," he said. Bosz lamented a poor second-half display by his team, while a mistake by right-back Jeremy Toljan allowed Kane to snap up possession and equalise on 49 minutes. "We conceded a goal from our own mistake for the first goal and from then on we didn't play well," said Bosz. "Mistakes like that shouldn't happen at this level. "The trust in our game is missing, that is logical, but I am proud of the way we fought in the first half against a very good team."